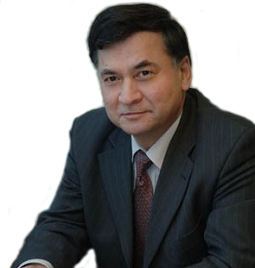 Zhaxybay Zhumadilov, M.D., Ph.D. is the current Director-General of the “National Laboratory Astana”, at Nazarbayev University, in Astana, Kazakhstan. He is the author of 550 peer-reviewed publications, and more than 29 inventions and patents. Dr. Zhumadilov has contributed to numerous scientific and social advancements. He developed some new methods to prevent septic complications from abdominal surgery. He invented, and implemented, erythrocyte pharmacocytes for treatment of patients with acute cholangites, biliary abscesses, and acute complicated cholecystitis into clinical practice for the first time, as well as a new method for treatment of severe soft tissue infections. He implemented fine-needle aspiration biopsy, in the Semipalatinsk region of Kazakhstan, to detect thyroid nodular diseases and thyroid cancer in areas adjacent to the Semipalatinsk Nuclear Test Site, and he further invented, and implemented, some new treatment methods for thyroid nodular diseases. He conducted a research project to study the relationships between fallout exposure and iodine deficiency in areas adjacent to the Semipalatinsk Nuclear Test Site. He implemented some improvements to the screening and treatment algorithms for thyroid nodular diseases in the Semipalatinsk Region of Kazakhstan. He organized, and conducted, thyroid screening and medical rehabilitation of the exposed population, participated in establishing the National Medical Holding in Kazakhstan and Life Sciences Center of Nazarbayev University, Astana, and, finally, invented and implemented the “Consortium of Probiotics” (Eurasian Patent Organization #14/017593-13, 30.01.2013). Conducted research project to study relationships between fallout exposure and iodine deficiency in areas adjacent to the Semipalatinsk Nuclear Test Site. Implemented some improvements of the screening and treatment algorithms for thyroid nodular diseases in the Semipalatinsk Region of Kazakhstan. Organized and conducted thyroid screening and medical rehabilitation of the exposed population. Participated in establishing the National Medical Holding in Kazakhstan and Life Sciences Center of Nazarbayev University, Astana. In 1995 awarded the Certificate of the Methodist Hospital, Houston, Texas. In 1998 awarded the Diploma of the Ministry ofHealth of Kazakstan. In 1998 awarded CRDF Award KN2-434, USA. In 2000 Dr. Zhumadilov was awarded by a Grant-in-Aid#12576025 for scientific research from the Ministry of Education, Science, Sports and Culture, Japan. In 2002, 2004 and 2005 awarded the Honorary Title: Leading Scientist of the Year. Has a range of certificates from International Associations and Organizations. In December, 2003 awarded a National Honorable title of Kazakhstan: “Distinguished Professor of the Republic of Kazakhstan”. In June, 2004 awarded the best publication of the year award from Hiroshima Journal of Medical Sciences. Since October 2004 Recipient of Governmental Scientific Award for education, research and health care. In 2008 awarded a Medal “10 years Astana”. In 2011 awarded a Medal “20th Anniversary of the Independence of Kazakhstan”. In 2012- best Employee of Nazarbayev University.